So I have a couple good rides on the strange beast. First thing I discovered is that the pedals are just not going to work. You can actually pedal the thing, that's not the issue. The problem is there is no way to ride it like a proper motorcycle with the pedals on. If you want to ride it like a mountain bike, it would be fine, but that's not what I want, so off came the pedals. I bolted some cheap footpegs on to see if it was worth the effort. The first kick to start up the bike, kickstarter hits the footpeg and snaps it off. Hmmmm.. first design issue. No worries, a piece of pipe to replace the broken peg, and off we go. Conclusion is that pegs are a great idea, so ordered up some proper dirt bike pegs and fabricated a couple simple brackets to bolt them on. Size, geometry work well and the right peg folds up and out of the way when you want to kick it over. 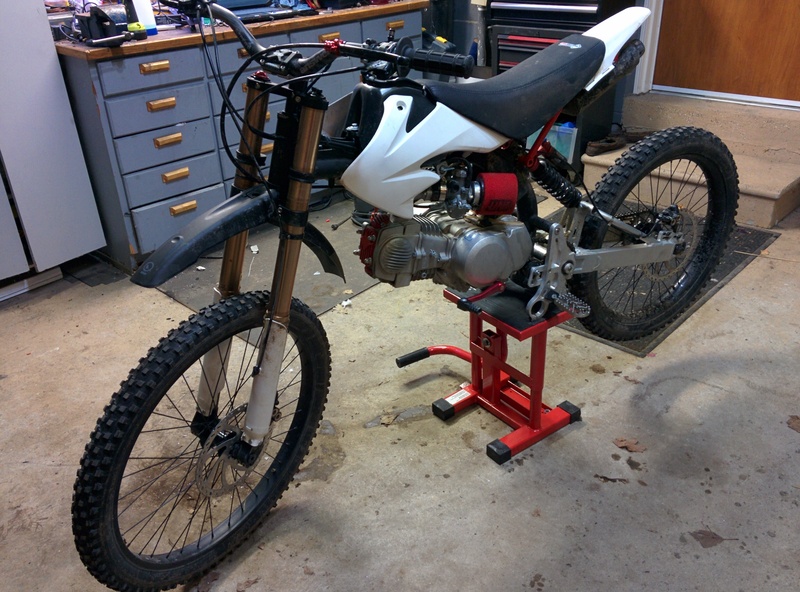 So now the bike is almost where I want it. Riding impressions? First of all, this thing is actually quite rideable. I was half expecting it be fragile, unstable and nothing more than a toy. Nope, it’s the real deal, a solid bike. In fact I the think it is too stable and doesn't turn quite as sharp as I would like for woods duty. I lowered the front forks in the triple clamps and it seemed to help without sacrificing any high-speed stability. The engine has very good power. It’s torquey enough at the bottom, and really rips when you rev it up. I honestly think you don't need any more power. The biggest problem is the heavy clutch pull. Not sure why it’s like that, it feels as heavy as my Multistrada 1100, and it makes it more difficult to manage the strange clutch/brake combo I have setup. Most bikes with engines this size (140cc) have very light clutches, not this thing. Gearing is fine, first gear is low enough and 4th gets you going as fast as you should on something like this. Exhaust is a touch loud if you want to run seriously stealth, but not obnoxious. Brakes are adequate, but still haven't got the front working as well as I should. There are some MTB caliper alignment tricks I have to try. Suspension is actually quite firm, so the bike doesn't wallow at all. I will soften it up next run to see if it rides a bit better. The biggest surprise is how stable the thing is to ride. Not sure if it’s the tires or the very low weight, but it tracks exactly where you put it. As most bikes will naturally follow a rut on a slippery trail, this thing simple ignores it. BTW, I did ride it in probably the worst conditions of ice, snow and mud so it has done a real test, not just a couple laps around a parking lot. Yes, you can ride it aggressively and beat on it. My pro rider buddy took it for a ride and was just ripping on it. Oh, and it loves to wheelie. Tons of torque, super light weight and rear weight bias make it a breeze. And I will take it on a motocross track this spring to see how well it flies. So lets compare it to a "real" dirtbike, my Husaburg FE450. Yes they are totally different beasts, but I will compare them anyway. Is the MotoPed easier to ride? Not really. You might assume that riding a bike that is less than half the weight (120lbs Vs. 260lbs) takes a lot less effort, but it’s not the case. I was working up a decent sweat throwing the MotoPed around. Sure getting it unstuck or lifting it up after a crash is nothing on the MotoPed compared to the Berg, it still requires effort (and skill) to ride it at speed. And the 140lbs less in weight will NOT instantly turn you into a Ryan Dungy or Chris Birch. I was half-considering actually doing a race this season on the MotoPed. I am not sure about that now. I am struggling to find a track that would suite its nature that would be better to ride on than the Berg. Perhaps some super-technical tight track would suite it better, more trials like terrain. Anyway, I will get a couple more rides on it to see how well I do on the MotoPed. I might even do some timed laps to compare my time on both bikes to see how much better or worse the MotoPed performs.